Our family lived in Barnards Cottage, on Town Green Road, and in the early years we collected our water from the spring in Chapel Orchard in two galvanised buckets. There was no electricity, we had to use paraffin lamps, our laundry had to be washed in a brick structure with a copper boiler, and cooking was on a solid fuel fireplace. We grew most of our vegetables in the garden adjacent to our house. The toilet was a wooden hut down the garden, adjacent to the orchard. There were several farms nearby. 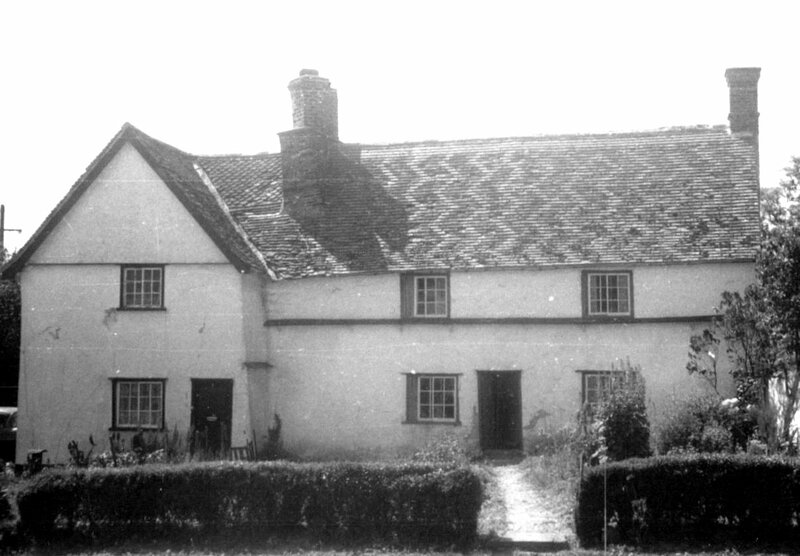 Mr Peters farmed at Manor Farm; Mr Miller had a farm near Hurdleditch corner (Grove Farm); Mr Titch Parcell’s farm was in Stocks Lane (Meadowcroft Farm), we earned pocket money here catching rats at harvest time! ; Mr Brown on Hillside also produced honey; Alf and Albert Arnold farmed at the corner of Malton Lane, (West Farm) and White Arch Farm was where we picked strawberries each year. Many farms still used horses on the land although tractors were becoming more dominant. Each year farmyards were usually full of straw stacks, and occasionally one would self ignite. There was a shoe repairer, Ernie Fuller, with access to his workshop in the lane which leads to the Village Hall car park and the Clunch Pit. Teddy Wilsher initially ran his garage in Town Green Road next to the brook. Cliff Bullen (of the builders Rayner & Bullen) lived up on Hillside. There was also a Chimney Sweep – I think he was called Mr Lavender. I also recall that Terry Taylor’s father had a hairdresser’s business in a hut between the footpath up beside the church wall heading to the Clunch Pit and what was then the Post Office. The village was almost self-sufficient and supported its own Post Office, Huddlestone’s (which sold almost everything from food, sweets, sewing cottons and materials, wood, and crockery), and Mr Miller's grocer's shop (site of the existing shop/post office). Mr Maddox repaired radios and charged lead/acid accumulators for 2/6d in a green hut at the bottom of the schoolhouse garden. As small children we would walk in groups (without adults) up Leaden Hill and across Mr Miller’s fields towards Kneesworth to watch Bassingbourn airfield for its aeroplanes, taking with us sandwiches and bottles of drink for a picnic. We would also catch sticklebacks and collect frogspawn in the brook next to the garage in Town Green Road. We would sometimes walk or bike along Barrington Road on our expeditions, running fast past the spinney where we believed the wicked witch lived. The annual village Church Fete had dancing round the maypole, bowling for a pig, fancy dress competitions and cake stalls. At Christmas carol singers went round the village, sometimes accompanied by a piano on the back of a farm trailer. I also recall an annual variety show with singers and musicians presented in the Village Hall (possibly by the Foxton Players). Every Armistice Day there was also a very well attended, and for us children a very grand, British Legion service with flags. I attended the Methodist Chapel Sunday School run by Alan and Peggy Miller, who significantly helped to form many of our lives. There were annual trips in coaches around mid-August to a seaside resort such as Clacton, Yarmouth, Skegness, or Felixstowe. It seemed there had always been a violent thunder storm the night before. Very few individuals or tradespeople in the village owned motor cars or vans. I think I can recall only the following: Mr Peters, Mr Howard the baker, Mr Clapton the vicar, The Fish & Chip van (Wrens? ), the Coalman, paraffin deliveries with associated household cleaning supplies, and the shops in general. Bus services ran frequently through the village to and from Cambridge, together with an Eastern Counties Red Bus service to Royston (no.119), and a United Counties Green Bus service (no 175) to Biggleswade and Bedford. Some aspects recalled above may have been viewed through rose tinted glasses, but this was a wonderful time and place to grow up in safety! This page was added by Pat Grigor on 23/10/2012.